BioComfort® foam is made with soy base polyol which comes from the oil in the seed of the soybean. This process of using soybeans does not affect food stock supplies and helps reduce the dependence on petroleum based products used in foam manufacturing. This is one step towards a cleaner environment. The Prestige Fabricators foam manufacturing process also includes filtration beds which contribute towards a friendly green environment. BioComfort® foam is used in all fabricated foam products from down blend cushions to spring seats. Prestige Fabricators has a state-of-the-art fabrication facility using advance computerized cutting technology and assembly systems to ensure the quality and integrity of your products. This provides a full range of high-quality foam and fiber products for a broad range of applications that can be fabricated to your exact specifications. All of the sofa sleeper mattresses made for you meet the Federal Standard 16 CFR 1633 requirements. Every FR (Fire Retardant) product is scanned and bar coded throughout each department with the final sofa mattress having all the information necessary for the standard. RFID (Radio Frequency Identification) is used in every sofa mattress to track and control inventory, production flow, and shipments. 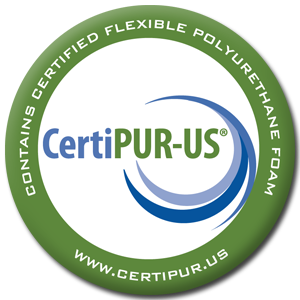 Only Prestige Fabricators has this customized technology in a sofa sleeper mattress to certify consumer safety.